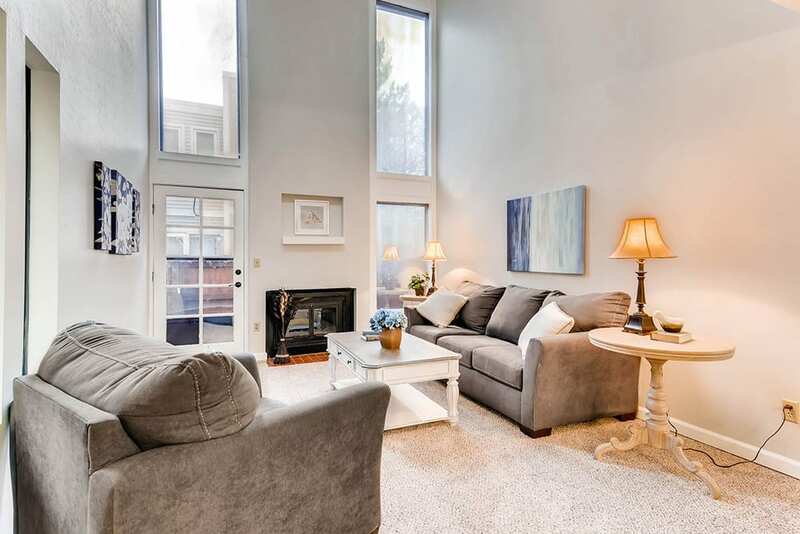 Wonderful townhome-style condo in southeast Denver! Centrally located between downtown and the Denver Tech Center, close to Cherry Creek Shopping Center, Lowry, and Highline Canal Trail. Entertaining will be effortless in the open living room with adjoining dining room and access to the private patio. Soaring two-story ceilings and a wood-burning fireplace appoint this welcoming space and clerestory windows flood the room with natural light. The spacious dine-in kitchen maintains new countertops and backsplash, ample cabinet space, and all appliances remain. Versatile flex space off the kitchen, ideal as a main-floor study or a playroom. Encompassed on the upper level is the master bedroom with a private bath and large walk-in closet. Perfect as a guest suite or secondary master, the second bedroom also maintains an attached full bath. Enjoy new carpet and fresh paint throughout. All bathrooms have been updated with new flooring, stylish mirrors, and modern lighting. Rest easy with newer furnace, water heater, and A/C unit (2017). Attached community parking garage with two deeded spaces. Close to several parks, a multitude of dining options, and ideally located within the community, close to the pool and clubhouse!